When it leans too far to the left, you have to lean right to move forward. When it leans too far to the right, you have to lean left. I don’t believe the same answer can, or should, be applied to every problem. There are even times when the correct answer for the same problem changes, based on other things happening in society at that time. Because of this, the correct answers to what ails society change pretty frequently. As the political spectrum has shifted to the right in this country, it seems many people have hardly noticed at all. Politicians and media alike refer to these two parties as "the left" and "the right" but that's only relative to each other. And sometimes it's actually wrong. There are now Republicans who are left of some of the more right-wing Democrats. We can't move forward with our country leaning this far to the right. I’ll define a few concepts on a politically “left or right” basis now, rather than “Democrat or Republican,” just to make sure I don’t confuse anybody. In common speak, Democrats are often referred to as “the left” and Republicans as “the right,” but that’s inaccurate. Much of what many members of the Democratic Party supports today are actually right-wing ideals, and some of what some members of the Republican Party supports today are actually left-wing ideals. Tends to be on the government side of the constant “government vs. private industry” struggle. Tends to care more about the rights of the people at large over the enforcement of laws or the rights of private industry. Tends to support higher taxes for the wealthy. Tends to be on private industry’s side of the constant “government vs. private industry” struggle. Tends to care more about the enforcement of laws and the rights of businesses and business owners over the rights of the people at large. Tends to be quicker to support warfare, although to say they’re “pro-war” isn’t really fair. Tends to support lower taxes for the wealthy. On the Political Compass (take your test here to find out where you truly fall), this is accurate. The only two boxes I'm unsure of are "Scandinavian Countries" and "Xenophobes." We don't actually have a left-wing party anymore. Bernie Sanders (an Independent), as you'll see in the next graphic, is barely left of center. If you ask Democrats (not the people in office, but the voting public) how to fix most economic problems, their answers almost always include some combination of “more regulation,” “higher taxes,” “higher minimum wage,” and “more labor unions,” just to name a few things. People are going to want to argue with me about this, but on the whole, it's very close to spot-on. If you ask Republicans (again, the voting public) how to fix most economic problems, their answer almost always includes some combination of “free market,” “less regulation,” “cutting taxes,” and those kinds of things. What I’m saying is that neither of them are right all the time. In reality, both of them are right occasionally, and there are times when both are wrong. There is no single set of answers to every problem. I think we all know this intuitively, but partisanship has a way of making us choose a “side” or a “team” that will ultimately determine for us what the answers to these questions should be. That’s dogma, and I’m not a dogmatic person. 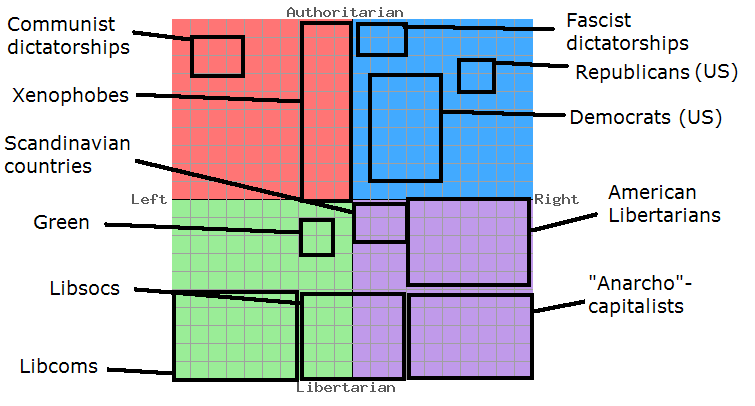 On the Political Compass, the more Authoritarian someone is ("the government is the boss, the people are the subjects") the farther up their dot lands, and the more Libertarian someone is ("the people are the boss, the government is employed to do as we ask") the farther down their dot lands. Left and Right are determined by a combination of things such as economics and warfare/foreign policy. Economically, the more a person would like the government to manage/control economics/industry, the farther left their dot lands, and with warfare/foreign policy, the more aggressive the person wants the military to be, the farther right their dot lands. There's going to be a lot of skepticism about this bottom political compass because of what we've been taught for so long, but on the whole, it's accurate. It's possible any name is one square off left/right and/or up/down, but it's very close. For Donald Trump, since he didn't have a government record of voting and support, I went off of his campaign promises/rhetoric and his past comments on subjects not covered in his campaign. Now, take a look at Bernie Sanders. He's barely left of center. He's about where the Democratic Party was when he was a child. Now take a look at how Hillary Clinton and Ronald Reagan line up. Or, for that matter, Hillary Clinton and Donald Trump. So, here's the thing: I do believe, using the concepts as outlined above, that our country as a whole has shifted too far to the top-right; we have far too many people in prison for victimless crimes, our rights are violated far too often and without reason, we have now been involved in an ever-expanding war for over 15 years, and the billionaire class has taken far too much of the economy for themselves. If we don’t correct for this rightward shift we’ve experienced, we’re doomed to continue going in circles, like we have for most of the last few decades. So, I support a significant shift to the left on many issues. That does not, however, mean I will continue to support shifts even farther to the left once we get back to moving the country forward. I won’t. And if I’m in office long enough to see the country begin to lean too far to the left, I will be the first one to start leaning back to the right. You can count on it.